A couple weeks back I found myself headed south of town on plant lust business. This trip actually had me venturing off of I-5, my usual route south, a great opportunity to see new things. One of the most curious sites that I kept seeing over and over were fields like this. Maybe some of you are familiar with this set up but I wasn’t, this is how Hops grow. Evidently the harvest had just happened (so I was told). Too bad, I would have loved to see them growing. My destination was Kraemer’s Nursery. They are a wholesale nursery and supply a great deal of the plants you might find at the West Coast big box stores. This nursery is big, very big! Just check out this greenhouse that goes on forever! I would share pictures of their beautiful plants with you, but the nursery is so large that we toured by car and there were no photo opportunities. On my way home I stopped at Al’s Garden Center in Woodburn, OR. I’ve heard a lot about Al’s but since they are located in the outlying areas (Woodburn, Gresham and Sherwood to be specific) I hadn’t been. And the rest of the usual fall line-up were all available. (although I could have done without the cabbage and kale) This is a sizeable nursery, and even though it was a weekday afternoon there were many people milling about. They’ve got the grasses covered. And the Heuchera too! I was smitten and had to have it. But the longer I stood there and looked at it I realized it seemed to be the type that gets a little leggy. Maybe I didn’t really need it. After all where would I put it? I walked away. The next temptation was this cute group of sharp plants, from left to right: Yucca filamentosa ‘Color Guard,’ Agave harvardiana (according to the tag, but possibly Agave havardiana? ), Aloe Hedgehog™, and barely visible Banana Split Soft Leaf Yucca. Here is a close up of the Banana Split….love the deep green/yellow color! Eryngium agavifolium. It’s rare to see one so big in captivity. Usually they are just small 4”pots. Aloe Vera, in my experience it is fairly rare to see a plant this large in a local nursery, and in good shape too! If it were earlier in the gardening season I would have bought one. I loved the graphic on the tag. Ah…Hello my spiky friends all grouped together! Evidently this little agave is having a time out. He’s been bad. Really? Why! We need information people! 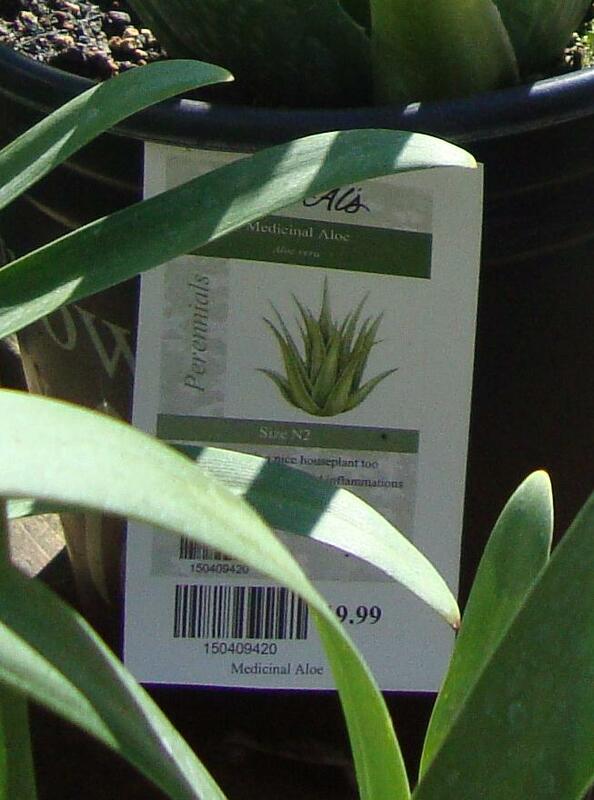 This is not just an assorted agave….it has a name! Use it! Is it hardy to 10 degrees or 30 degrees??? If you are charging $60 for an agave I need to know what it is so that I can properly care for it. Again with this one. Charming, no? My blood pressure is rising. Let’s move on to be distracted by the pretty flowers shall we? Tuscarora Crape Myrtle. Did you know it’s time to plant? The sign says so. As I mentioned earlier, this place is big. I didn’t venture all the way to the back…just big trees and things that I have no place for, or more importantly no way to transport home. Instead I headed inside and came face to face with the largest Euphorbia Tirucallii I’ve ever seen. What a beauty. How I longed to take it home and keep it outside (for a while) and watch it turn vibrant orange with the cool night temperatures. But at $49.99 that wasn’t going to happen (plus I already have a smaller one to attempt to over-winter). And naturally before I left I had to encounter another fine selection of agaves. All with the uber-helpful tag “Agave Assorted”…oh the insult. ZOMG....those tags kill me, absolutely KILL me! They kinda make me want to shake my fist at the sky and throw things :-( Seriously, if you're expected to spend $60 on a plant, couldn't they even take a moment to write down the hardiness? I would rather not put a plant out for sale than put one out with no information on the tag. I am not postive, but your mystery set-up looks similar to the cut Christmas tree waystations up in the mts. on this coast where they are kept moist and shaded after being cut and waiting to be shipped. I could be wrong, it has been known to happen. Not even the name of the grower so you could send a frustrated e-mail ? Weak. They sure looked perky though didn't they ? I've never been to Al's, guess I need to put it on my list-I can participate in riskier behavior here in zone 9 ! Yucca 'Banana Split' -- swoon! I'd try that one as a zone pusher if I came across it, which I probably won't here in Z6, which is perhaps for the best. I'm working on getting a colony of 'Color Guard' established, grudgingly, in part shade. Those tags are funny, but unfortunately common wherever I go. Actually, yesterday I saw Ficus Benghalensis at Whole Foods labeled as alternately "Ficus Palm" and "Fiscus Palm"! scott, exactly! I am so glad you feel my pain. Les, YOU are the kind of person every nursery needs running the show. And you are so right about the "set-up" it does look like that! Except way way taller. Like telephone pole tall. ks, you and your risky zone 9 behavior! You know I am jealous. Andrew, how does the part-shade effect the color? RFG, I realize some spelling differences and naming conventions are going to be a little off (occasionally) but no info at all? Pathetic. You'd think a large nursery like Al's could spring for a little informational signage. It really is insulting. Jenn, I understand about the hybrid business but I really don't think that was the case here. I'm pretty sure I could make an educated guess what 2 of the 3 were but for that money I shouldn't have to! FYI, having gotten much of my garden plants at Al's over the past 25 years, I will tell you they are extremely helpful with information about the plants if you ask them. Many people just go and buy what looks pretty, and they don't do much research. Plus their nursery, although covered by plastic in many areas, and weather protected, is open year round, so I'm going to make an educated guess that most of what they have can survive in the NW. It's not too much to ask a question or two.